A few pictures from our driver Robin on the Tenby & Pembrokeshire Coast holiday. This is not only one of our drivers’ favourite resorts but year after year the Edelweiss is rated top European Hotel by the regular clients of Crusader Holidays. Our holiday base, Lermoos, is simply one of the most picturesque villages in Austria positioned in the shadow of the mighty Zugspitze Mountain, close to Fern Pass, in the lush green meadows of the Loisach Valley. Typically Tyrolean, the village is surrounded by forest with cable-car connections up the mountain for wonderful views. Set close to the German border, it is superbly positioned for touring the scenic delights of both the Austrian Tyrol and Bavaria. 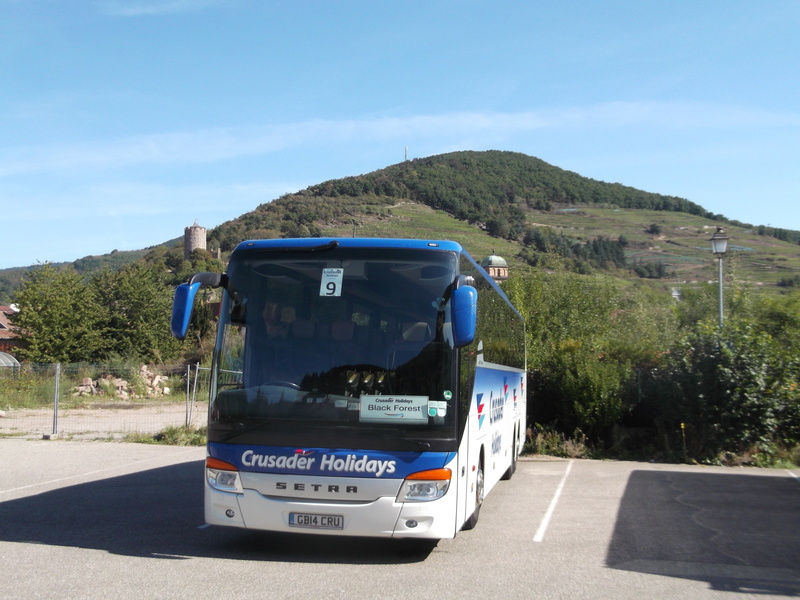 Congratulations to Eddie O’Gorman for this great picture of one of the Crusader Holidays coaches while on the Black Forest tour. We hope to see you aboard soon! Where you will you? This is a hugely popular holiday exploring one of France’s most beautiful regions, the Dordogne. It’s an idyllic countryside of outstanding natural beauty, rich in history and legends with magnificent châteaux, caves, medieval towns and picturesque villages. Our holiday centre, Rocamadour, has been attracting visitors since the Middle Ages when it was an important place of pilgrimage – today it’s an attractive base for exploring. Built on a cliff-face towering over the Alzou Canyon, it enjoys a truly remarkable setting and still retains much of its old charm and character.